* Moore lab members' names are underlined. ​Brusca, R.C., W. Moore, S.M. Shuster. 2016. Invertebrates. 3rd Edition. Sinauer Associates, Sunderland, MA. ​Brusca, R.C. and W. Moore. 2013. 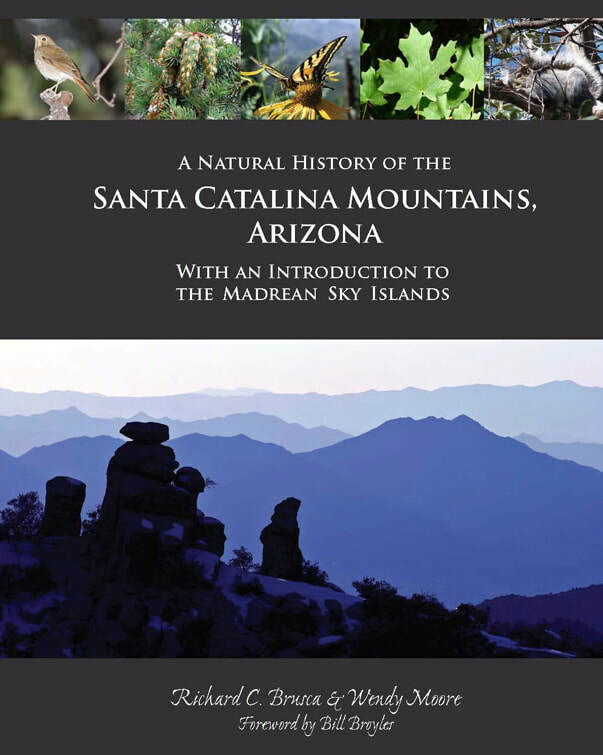 ﻿﻿A Natural History of the Santa Catalina Mountains, Arizona with an Introduction to the Madrean Sky Islands﻿.﻿ Arizona-Sonora Desert Museum Press. 232 pp. (not peer-reviewed) Read reviews: UANow, Tucson Weekly, Amazon.com. Southwest Books of the Year: 2013 Award Winner! Irwin, M. E. and W. Moore. (In press) Advances in identification and monitoring of crop insect pests and applications to IPM. In: Kogan M. & Heinrichs E. (eds), Integrated management of insect pests: Current and future developments. Cambridge: Burleigh Dodds Science Publishing. ​Nagel P., J.A. Robertson, W. Moore. 2017. New Nomenclatural and Taxonomic Acts, and Comments. Carabidae: Paussinae: Paussini. Pp.12-18 in Löbl I. & Löbl D. (eds), Catalogue of Palaearctic Coleoptera. Archostemata-Myxophaga-Adephaga, Revised and Updated Edition, Vol.1. Leiden, Boston: Brill. Nagel P., J.A. Robertson, W. Moore. 2017. Catalogue. Subfamily Paussinae Latreille, 1806. Pp. 466-470 in Löbl I. & Löbl D. (eds), Catalogue of Palaearctic Coleoptera. Archostemata-Myxophaga-Adephaga, Revised and Updated Edition, Vol.1. Leiden, Boston: Brill. Moore, W. 2016. Hexapoda. In: Invertebrates. 3rd Edition. Sinauer Associates, Sunderland, MA. Moore, W. 2015. Sky Islands. In: A Natural History of the Sonoran Desert. 2nd Edition. M.A. Dimmitt, ​P.W. Comus, L.M. Brewer (eds. ), University of California Press, Berkeley. Muzzi, M., W. Moore, A. Di Giulio. 2019. Morpho-functional analysis of the explosive defensive system of basal bombardier beetles (Carabidae: Paussinae: Metriini). Micron 119: 24-38. Hughes, G.B. and W. Moore. 2018. Monophyly of the subfamily Neobisiinae (Pseudoscorpiones: Neobisiidae). Journal of Arachnology 46:481–487. Schaller J.C., G. Davidowitz, D.R. Papaj, R.L. Smith, Y. Carrière, W. Moore. 2018. Molecular phylogeny, ecology and multispecies aggregation behaviour of bombardier beetles in Arizona. PLoS ONE 13(10): e0205192. Highlighted by PBS NOVA and AAAS Science Update and Scientific American. Arndt, E.M., W. Moore, W.K. Lee, C. Ortiz. 2015. Mechanistic origins of the bombardier beetle (Brachinini) explosive pulsed chemical defense. Science 348: 563-567. Neafsey, D.E., R.M. Waterhouse, M.R. Abai, S.S. Aganezov, M.A. Alekseyev, J.E. Allen, J. Amon, B. Arcà, P. Arensburger, G. Artemov, L.A. Assour, H. Basseri, A. Berlin, B.W. Birren, S. A. Blandin, A.I. Brockman, T.R. Burkot, A. Burt, C.S. Chan, C. Chauve, J.C. Chiu, M. Christensen, C. Costantini, V.L.M. Davidson, E. Deligianni, T. Dottorini, V. Dritsou, S.B. Gabriel, W.M. Guelbeogo, A.B. Hall, M.V. Han, T. Hlaing, D.S.T. Hughes, A.M. Jenkins, X. Jiang, I. Jungreis, E.G. Kakani, M. Kamali, P. Kemppainen, R. C. Kennedy, I.K. Kirmitzoglou, L.L. Koekemoer, N. Laban, N. Langridge, M.K.N. Lawniczak, M. Lirakis, N.F. Lobo, E. Lowy, R.M. MacCallum, C. Mao, G. Maslen, C. Mbogo, J. McCarthy, K. Michel, S.N. Mitchell, W. Moore, K.A. Murphy, A.N. Naumenko, T. Nolan, E.M. Novoa, S. O'Loughlin, C. Oringanje, M.A. Oshaghi, N. Pakpour, P.A. Papathanos, A.N. Peery, M. Povelones, A. Prakash, D.P. Price, A. Rajaraman, L.J. Reimer, D.C. Rinker, A. Rokas, T.L. Russell, N. Sagnon, M.V. Sharakhova, T. Shea, F.A. Simão, F. Simard, M.A. Slotman, P. Somboon, V. Stegniy, C.J. Struchiner, G.W.C.Thomas, M.Tojo, P. Topalis, J. M.C. Tubio, M.F. Unger, J. Vontas, C. Walton, C.S. Wilding, J.H. Willis, Y. Wu, G. Yan, E.M. Zdobnov, X. Zhou, F. Catteruccia, G. K. Christophides, F.H. Collins, R.S. Cornman, A. Crisanti, M.J. Donnelly, S.J. Emrich, M. C. Fontaine, W. Gelbart, M.W. Hahn, I.A. Hansen, P.I. Howell, F.C. Kafatos, M. Kellis, D. Lawson, C. Louis, S.Luckhart, M.A.T. Muskavitch, J.M. Ribeiro, M.A. Riehle, I.V. Sharakhov, Z. Tu, L.J. Zwiebel, N.J. Besansky. 2015. Highly evolvable vectors: the genomes of 16 Anopheles mosquitoes. Science 347: 1258522. ​Moore, W. and J.A. Robertson. 2014. Explosive adaptive radiation and extreme phenotypic diversity within ant nest beetles. Current Biology 24: 2435-2439. DOI: 10.1016/j.cub.2014.09.022. pdf Highlighted in Nature 514:142. Di Giulio, A., S. Fattorini, W. Moore, J.A. Robertson, E. Maurizi. 2014. Form, function and evolutionary significance of stridulatory organs in ant nest beetles (Coleoptera: Carabidae: Paussini). European Journal of Entomology 111 (5): 692-702. DOI: 10.14411/eje.2014.083. Brusca, R.C., J.F. Wiens, W.M. Meyer, J. Eble, K. Franklin, J. T. Overpeck, W. Moore. 2013. Dramatic Response to Climate Change in the Southwest: Robert Whittaker's 1963 Arizona Mountain Plant Transect Revisited. Ecology and Evolution. 3(10): 3307-3319. Moore, W., W.M. Meyer, J.A. Eble, K. Franklin, J.F. Wiens and R.C. Brusca. 2013. Introduction to the Arizona Sky Island Arthropod Project (ASAP): systematics, biogeography, ecology and population genetics of arthropods of the Madrean Sky Islands. In: Merging science and management in a rapidly changing world: biodiversity and management of the Madrean Archipelago III. 2012 May 1-5, Tucson, AZ. (G.J. Gottfried, P.F. Ffolliott, B.S. Gebow, L.G. Eskew, compilers). Proceedings RMRS-P-67. Fort Collins, CO: U.S. Department of Agriculture, Forest Service, Rocky Mountain Research Station. Moore, W. 2011. Biology needs cyberinfrastructure to facilitate specimen-level data acquisition for insects and other hyperdiverse groups. ZooKeys 147: 479-486. ​Moore, W., X. Song, A. Di Giulio. 2011. The larva of Eustra (Coleoptera, Paussinae, Ozaenini): a facultative associate of ants. ZooKeys 90:63-82. Ziegler, R., J. Isoe, W. Moore, M. A. Riehle, M. A.Wells. 2011. The putative AKH receptor of Manduca sexta and its expression in fat body during development. Journal of Insect Science 11(40):1-14. Di Giulio, A. and W. Moore. 2009. The first known larva of the Australian genus Mystropomus Chaudoir (Coleoptera: Carabidae: Paussinae). Australian Journal of Entomology 48: 140-148. Moore, W. and A. Di Giulio. 2008. Metrius Eschscholtz (Carabidae: Paussinae) is not a millipede specialist. Pan Pacific Entomologist 84(1): 33-34. Moore, W. 2008. Phylogeny of the Western Hemisphere Ozaenini (Coleoptera: Carabidae: Paussinae) based in DNA sequence data. Annals of the Carnegie Museum 77(1): 79-92. Moore, W. and A. Di Giulio. 2006. Description and behaviour of Goniotropis kuntzeni larvae (Coleoptera: Carabidae: Paussinae: Ozaenini) and a key to genera of Paussinae larvae. Zootaxa 1111: 1-19. Moore, W. 2004. Description of a new Hawaiian isopod, Synidotea oahu (Crustacea: Isopoda: Valvifera). Proceedings of the Biological Society of Washington 117(1): 76-87. Moore, W. and R.C. Brusca. 2003. A monograph on the isopod genus Colopisthus (Crustacea: Isopoda: Cirolanidae) with the description of a new genus. Journal of Natural History 37(11): 1329-1399.